Many of the traditional German Christmas market decorations and ornaments originate from the Erzgebirge region, famous for its mining villages. Woodcarving was also a tradition in the area and eventually the handmade toys and ornaments from the region became popular throughout Germany. One of the decorations most closely tied to the area is the idea of the Christmas arch ('Schwibbögen' in German). As the story goes, miners used to leave their lamps at the pit entry in a semi-circular pattern on the last shift before the Christmas break and the arch symbolises the pit entry with the lights. The first decorative Christmas arches were made of metal, with candles on top of the arch and scenes from miners' lives underneath. Nowadays many of the ones on sale at the markets are carved or turned from wood and the scenes underneath the arch can be religious or everyday subjects. Another of the traditional wooden Christmas decorations, which the Erzgebirge also claims as part of its heritage, are the Christmas pyramids. Again originally these were slightly different, with a pyramid shaped wooden construction with candles on the top. Eventually this developed by adding a central spinning pole and then light wooden blades similar to a propellor. The heat from the candles underneath helped to turn the blades and, on the turning plate at the bottom, figures were carved. Nowadays the Christmas pyramids can be extremely intricate (and expensive!) and have become a worldwide symbol of a traditional German Christmas. Probably the most recognisable of the carved wooden ornaments are the nutcracker soldiers and the Räuchermännchen (the 'smoking' figures). 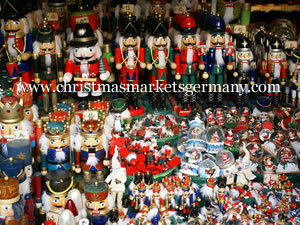 Nutcrackers were made in the Erzgebirge again, but also in the dollmaking areas of Thuringia. The smoking figures are designed so that incense can be burned inside the figures which then comes out of a pipe or the figure's mouth. The small wooden Christmas tree ornaments are produced and sold in many woodcarving areas, such as the Erzgebirge and Thuringia mentioned above, but also in Bavaria and the Black Forest and are a staple of the 'Christmas shops' found in different towns and cities these days. The glass Christmas tree decorations are also reckoned to have originated in Germany, but this time from a specialist glassblowing town in Thuringia, a place called Lauscha. 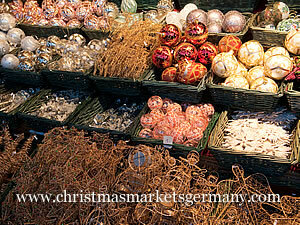 The first Christmas baubles were made in the 19th century and became popular in Germany. However sales really took off when the British public saw Queen Victoria's Christmas tree which had been decorated with ornaments from Prince Albert's German homeland. In 1880 the Christmas tree decorations were discovered by the American retailer F.W. Woolworth and he was soon ordered thousands of examples for his growing chain of stores.